Rihanna’s Savage X Fenty Fall/Winter 2018 fashion show closed NYFW on Wednesday (September 12) in Brooklyn, New York. 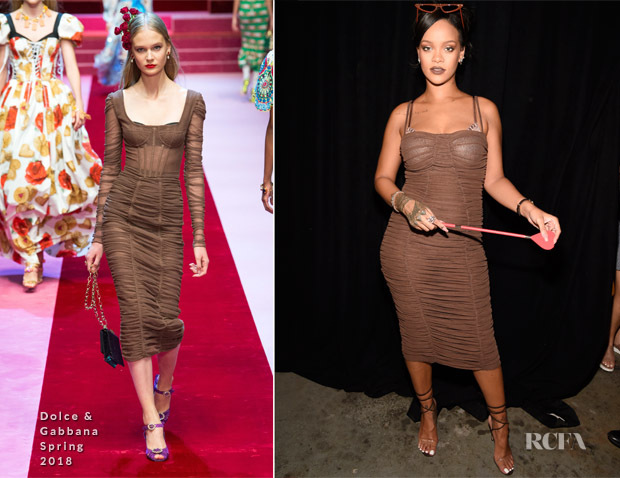 Rather than wear a look from her own Fenty x Puma line, the singer wore a Dolce & Gabbana Spring 2018 dress. My first reaction to this was disappointment. I believe this brown hue was chosen to resemble second skin, as she was promoting her lingerie line after all, but I found the look really unflattering. Had this been a black, I believe the dress would’ve been much more forgiving. A Chopard watch, Harry Kotlar diamond studs, Le Vian garnet earrings and diamond bracelets, and Brumani quartz rings accessorized her look along with strappy sandals and funky red shades.